If you’re a cryptocurrency trader looking for an edge (and what trader isn’t? ), you may have heard about algorithmic trading. If you’re a relatively new trader, you may have dismissed the idea as being too complex. Here’s the good news: You don’t need to be an advanced or even moderately experienced cryptocurrency trader to develop algorithmic trading strategies. Thanks to the introduction of powerful, yet simple to deploy bots, beginning traders have access to the advantages offered by an algorithmic approach. 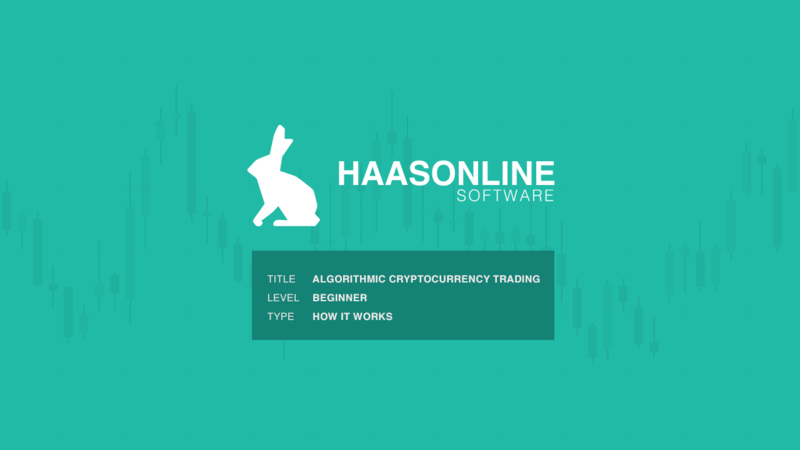 To help you better understand how it all works, let’s take a closer look at the basics of trading with algorithms and the benefits it offers. Algorithmic trading (sometimes called automated trading) is a process by which computers are used to execute trades according to a predefined set of instructions — or what is known as an algorithm. By programming computers to execute orders based on trading signals, greater profits can theoretically be generated, as humans cannot trade with the speed, frequency or efficiency of an algorithm. One example: Humans cannot monitor markets around the clock; we need to eat, sleep and work. Algorithms, however, can operate indefinitely, seizing upon market opportunities as they unfold. Computerization of the U.S. stock market began in the 1970s. By the 1980s, the basics of algorithmic trading were in place with the dawn of early automated “program trading.” These first early algorithms allowed traders to realize a profit by triggering a trade once a certain gap developed between the value of equities and futures markets. As the pace of digitalization increased, algorithmic trading became far more sophisticated. Traders used machines to identify temporary mispricing and compare prices across a large number of markets simultaneously, unlocking enormous profits and establishing algorithmic trading strategies as an essential part of the Wall Street landscape. Today, these trading strategies are becoming equally entrenched among cryptocurrency traders seeking a competitive edge. Algorithms are deployed in cryptocurrency markets much the same way they are used in equities markets. By integrating algorithms, it’s possible to build a systematic trading framework that offers a lot of market benefits while also reducing the odds of trader error. Trades for coins and tokens are automatically executed according to predetermined conditions. To do this, cryptocurrency traders run programs called bots. Trading bots are software programs designed to communicate with exchanges and execute trades on your behalf. Bots can directly access an exchange’s order books through a simple API and can be designed with specific features and purposes in mind. For example, an arbitrage trading bot is designed to identify pricing disparities between exchanges; if traders are selling a token for $100 on one exchange and paying $102 for that token on a second exchange, the algorithm can take advantage of this temporary spread. The removal of emotion and irrationality from trades. Trades can be executed with greater speed to reduce missed opportunities. Lowered risk of data errors being entered manually (fat finger mistakes). Backtesting helps validate the viability of trading strategies. Around-the-clock trading allows opportunities to be seized whenever they arise. While there are a wide variety of bots in existence (and, in fact, they are customizable through scripts), choosing the appropriate bot (or bots) to implement a trading strategy is a core challenge for algorithmic crypto traders. It’s important to understand that bots are not all-knowing oracles that can intuitively grasp the right trades to make. Bots are merely tools that allow traders to implement their existing trading strategies more efficiently. Because traders vary widely in their philosophy and approach, bots also vary widely in their design. Inter-exchange arbitrage bots (for those who use multiple exchanges). Flash crash bots, which take advantage of temporary crashes in the value of a token or coin. Basic trade bots, which can be configured to follow all sorts of pre-determined strategies. Trendline bots, which use basic technical analysis (the trend lines drawn on charts) to execute trades. Index bots, which help create a diverse portfolio of cryptocurrencies that are managed much like an index fund. Stop loss bots, which automatically sell at a certain fixed or dynamic price. It should be noted that not every bot is suited for every trader. While a basic trade bot might be a good choice for a beginner, a customizable script bot or a market-making bot is designed with the advanced trader in mind. Trader sophistication and risk tolerance should be key considerations when choosing the right type of bot to deploy. Once you’ve made this assessment, you’ll be ready to choose a group of bots well-suited to the execution of your overall trading strategy. Understanding how insurances, safeties, and technical indicators work is another important part of successful algorithmic trading. Insurances are essential conditions that must be met before a bot executes a trade on an exchange. For example, a bot can be programmed never to sell a coin or token for less than the purchase cost. A bot may also be programmed to avoid trades where exchange fees would lead to unprofitability or to only allow trades that generate at least twice the fee amount in profits. Safeties, on the other hand, are defined events that will trigger a trade. One example: A safety can follow the price of a coin or token during an upswing, then sell as soon as the reversal begins. Safeties can also automate sells once a certain profit threshold has been reached, or a specified loss has been incurred. Finally, bots can be programmed to work hand in hand with technical analysis — a process by which variables such as price movement, volume, and historical data are analyzed to identify trading opportunities. Bots can initiate trades based on popular predictive variables such as Relative Strength Indicators, Bollinger bands, candle formations and other chart patterns. Day trading, whether in stocks or cryptocurrencies, is simply the act of buying or selling assets on the same day in order to take advantage of short-term fluctuations in value. Because cryptocurrency is a maturing asset class, markets tend to be more volatile, something which makes them attractive to many day traders. In the U.S., the SEC and FINRA require that day traders maintain a minimum of $25,000 equity in their trading account. Cryptocurrencies are not bound by these rules — anyone can day trade. All that’s needed is a funded exchange account. To day-trade successfully, however, it’s essential to have some basic market knowledge and the appropriate tools. Algorithmic trading can help both beginning and advanced day traders implement their strategies with more efficiency. By using the right combination of bots, insurances, and safeties, newcomers can limit their potential risk by establishing tight trading parameters and eliminating emotion and irrationality. Meanwhile, advanced day traders can deploy more sophisticated bots that incorporate high-level technical analysis to uncover market opportunities as they develop. Much as it transformed equities markets, algorithmic trading has become an indispensable part of the cryptocurrency landscape. The introduction of easy to use yet powerful bots have placed the power of algorithmic trading in the hands of everyone, regardless of skill level or experience. If you’re interested in incorporating algorithmic trading into your approach, explore our features page which shows all of our different bot types available for use. Haasbot 2.0 has been released!